More than 100 water rights activists from Flint, Mich., and Detroit made the overnight bus journey to Washington, D.C., to attend a Feb. 3 Congressional Oversight Committee hearing on the Flint water crisis. They cheered for Lee Ann Walters and Marc Edwards, whistleblowers who helped force the scandal into the public eye. Walters, a mother of three whose children have been affected by lead in Flint’s water, is co-founder of “Water You Fighting For.” Edwards is the Virginia Tech University professor and water safety expert whose team demonstrated that lead levels in Flint’s water spiked after the city began drawing water from the highly polluted Flint River. Wanted poster in Southwest Detroit. The group watched congressional representatives grill state and federal officials. Democrats focused their finger pointing at Michigan state Department of Environmental Quality officials appointed by Gov. Rick Snyder; Republicans went after the federal Environmental Protection Agency. Committee chair Jason Chaffetz, a Utah Republican, threatened to “hunt down” Darnell Earley, Flint’s governor-appointed emergency manager at the time that Flint stopped using Detroit’s water and failed to add anti-corrosive chemicals to water from the Flint River. This allowed lead to leach from pipes into the tap water. Chaffetz threatened Earley after he publicly refused to testify before the committee and his attorney would not accept delivery of a subpoena. The subpoena coincided with Earley’s resignation as emergency manager of Detroit Public Schools. DPS teachers held numerous sick-outs demanding Earley’s firing, calling it outrageous that anyone responsible for the Flint water crisis be entrusted with the safety of Detroit schoolchildren. Under Earley’s watch, class sizes have topped 50 students in a room. Buildings lack heat, have mold-covered walls, are rodent-infested and have peeling paint. Falling ceiling tiles have injured at least one student. Earley has now agreed to appear before the committee, but the big question remains: Why hasn’t Gov. Snyder been called to testify? New evidence of his culpability emerges daily. Snyder aide Harvey Hollins stated he was informed in March 2015 by the DEQ of the uptick in Legionnaires’ disease, coinciding with the switch to Flint River water in April 2014. Few believe Snyder spokesperson David Murray’s claim that “the issue was not brought to the governor’s attention until January of this year.” (Detroit News, Feb. 6) For 10 months the 87 cases that resulted in at least nine deaths were hidden from public scrutiny. Earley, his predecessor Ed Kurtz and his successor Jerry Ambrose share blame for the scandal: for the decision to tap into the polluted Flint River, for the failure to add anti-corrosive chemicals and for the refusal to switch back to the Detroit system after residents complained of hair loss, skin rashes, kids failing school, aching bones and compromised immune systems. However, every governor-appointed emergency manager answers to Snyder. Rather than admit guilt, Snyder is whining that protestors are heckling him and calling him names. 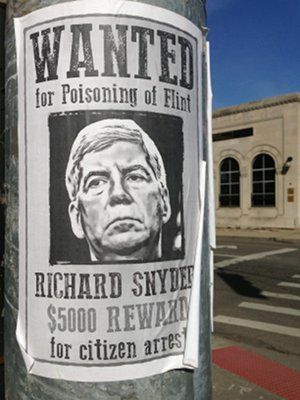 “Wanted” posters are sprouting up in Detroit, Flint and outside the governor’s new condo in Ann Arbor. 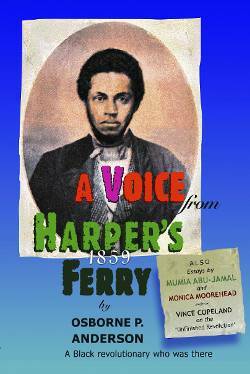 He cannot appear in public without inviting confrontation. Now that the Flint crisis is an embarrassment to the Republicans, Hillary Clinton and Bernie Sanders have agreed to hold a debate in Flint. After the revelation of the governor’s probable cover-up of the Legionnaires’ situation, the Michigan Democratic Party finally called for Snyder’s resignation. The people, however, want him behind bars — immediately! Even with the deployment of 200 National Guard, more distribution sites and door-to-door deliveries, people are not getting the water they need. Nothing has been done to the water to prevent the skin rashes still afflicting Flint residents. People who can afford to are washing themselves with bottled water. Snyder has proposed spending $30 million to provide credit to water customers who paid for undrinkable water. This money, however, is not a refund, but only a credit on future bills. Anyone who is behind in their water bill can still have service shut off! Shut-off water means children can be taken from their parents by the state. People are trapped in Flint. Many are underwater in their mortgages — they owe more than the value of their home — and their homes are unsellable. Renters lack money for a security deposit on a new apartment. Police are knocking on doors, purportedly to deliver filters, but then arresting anyone with an outstanding warrant. If the city is a prison, doubly imprisoned are inmates in the Genesee County jail, who are still drinking toxic tap water. This includes pregnant women. Human solidarity has brought truckloads of water to Flint; hundreds of volunteers make home deliveries every weekend. Unions, faith communities and youth organizations around the country are joining the effort, along with athletes and entertainers. What Flint needs, however, is a new water infrastructure that delivers clean, potable water from the tap. Why isn’t that happening? Hip-hop producer Russell Simmons, in Flint to make a donation, called the situation “environmental racism.” Institutional racism, endemic to capitalist society, allowed the poisoning of a Black-majority city, one stripped under emergency management of basic democratic rights. 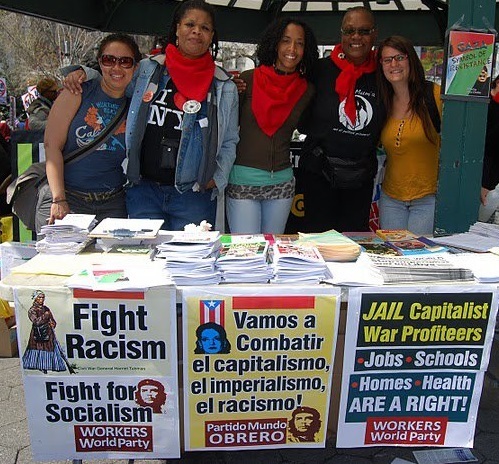 The capitalists who impoverished Flint are as racist as the politicians. General Motors’ restructuring left Flint without jobs and without a tax base. The banks dealt another blow with mass foreclosures and debt-driven austerity. Do more than donate. Build a “Flint Lives Matter” movement in your city or town. Demand the arrest of Gov. Rick Snyder! 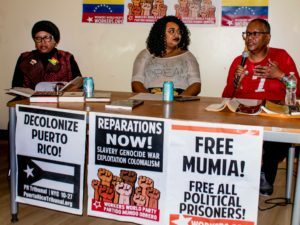 Demand reparations — make GM and the banks pay immediately!